High priest under Ahaziah, Athaliah, and Jehoash (Joash). By his marriage with the princess Jehosheba or Jehoshabeath, daughter of Jehoram, he became the brother-in-law of Ahaziah (II Chron. xxii. 11). 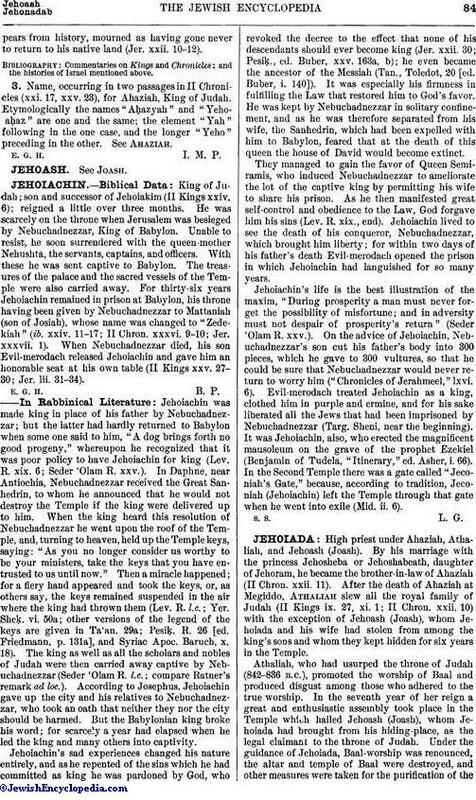 After the death of Ahaziah at Megiddo, Athaliah slew all the royal family of Judah (II Kings ix. 27, xi. 1; II Chron. xxii. 10) with the exception of Jehoash (Joash), whom Jehoiada and his wife had stolen from among the king's sons and whom they kept hidden for six years in the Temple. Athaliah, who had usurped the throne of Judah (842-836 B.C. ), promoted the worship of Baal and produced disgust among those who adhered to the true worship. In the seventh year of her reign a great and enthusiastic assembly took place in the Temple which hailed Jehoash (Joash), whom Jehoiada had brought from his hiding-place, as the legal claimant to the throne of Judah. Under the guidance of Jehoiada, Baal-worship was renounced, the altar and temple of Baal were destroyed, and other measures were taken for the purification of theTemple. 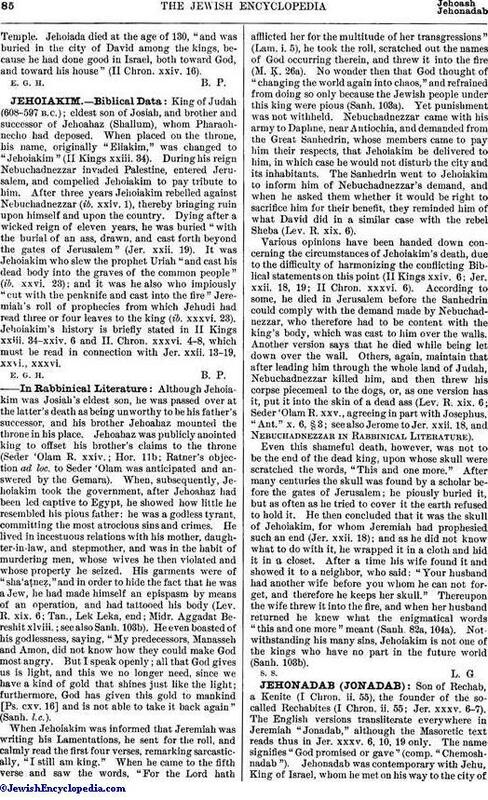 Jehoiada died at the age of 130, "and was buried in the city of David among the kings, because he had done good in Israel, both toward God, and toward his house" (II Chron. xxiv. 16).